Reply 'To Robert Campbell of Ashnish Esqr', concerning the case of his daughter. Cullen states 'the regard I have for you & therefore for your family', and gives directions and a recipe for her. 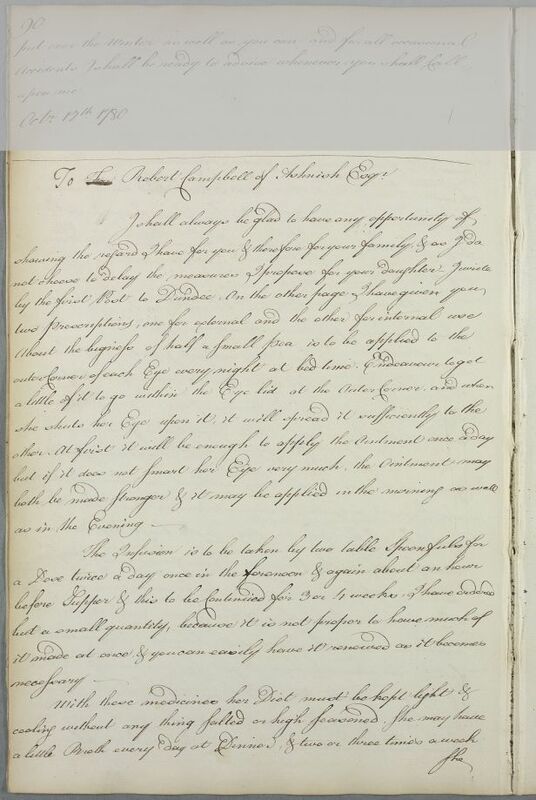 Summary Reply 'To Robert Campbell of Ashnish Esqr', concerning the case of his daughter. Cullen states 'the regard I have for you & therefore for your family', and gives directions and a recipe for her. Case of the Miss Campbell of Ashnish who has an eye disorder. 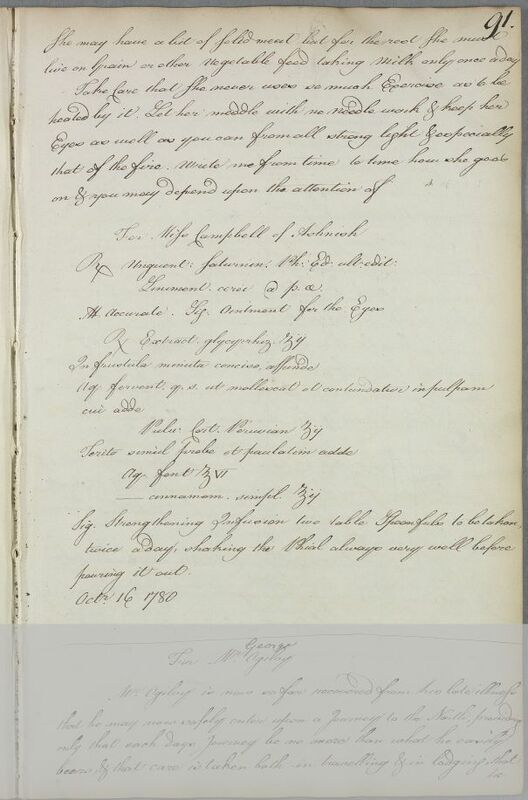 To For Robert Campbell of Ashnish Esq r.
Take: even amounts of Unguent Saturninum and Cerates Liniment, as in the most recent edition of the Edinburgh Pharmacopœia. Mix well. Label: Ointment for the Eyes. Take two drachms of licorice extract, divide into concise small amounts; a sufficent amount of boiling water required to soften and pound into a pulp; to which add, two drachms of [finely powdered?] Peruvian Bark. Rub together properly and add by small amounts six ounces of Spring water, and two ounces of simple cinnamon water. Label: Strengthening Infusion two table Spoonfuls to be taken twice a day, shaking the Phial always very well before pouring it out.